Sudheer Babu and Aditi Rao Hydari’s intense romantic drama Sammohanam hit the theatres on June 15. The film is rocking ever since its release and is impressing all sects of audience. As soon as celebs watched the film, Twitter was filled with best wishes and appreciations for the team. 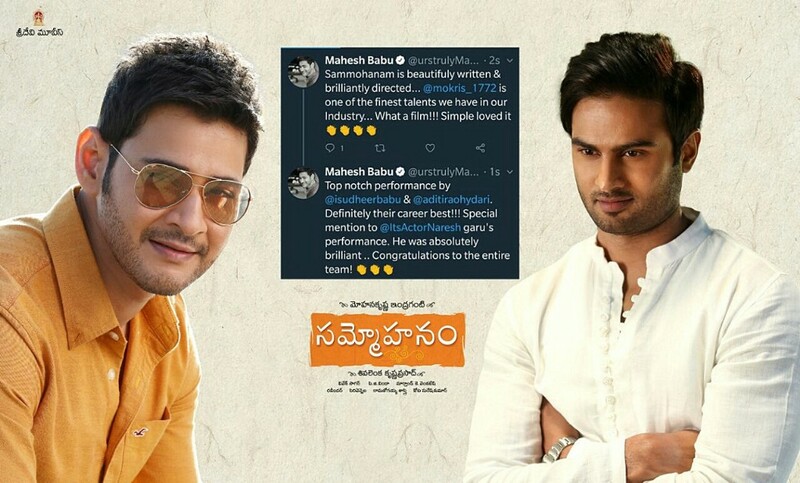 Mahesh Babu in a series of Tweets praised the performance of the team and wrote, “Sammohanam is beautifuly written & brilliantly directed... @mokris_1772 is one of the finest talents we have in our Industry... What a film!!! Simple loved it 👏👏👏👏." He also praised Sudheer Babu and Aditi Rao Hydari for their performances. He tweeted, “Top notch performance by @isudheerbabu & @aditiraohydari. Definitely their career best!!! Special mention to @ItsActorNaresh garu's performance. He was absolutely brilliant .. Congratulations to the entire team! 👏👏👏." Aditi Rao Hydari was very much thriller by Mahesh Babu’s Tweets and thanked him for his praises.